Grocery shopping in a country other than your own is a minefield and even more so when you don’t speak the language. With herrings, mackerals and liver pate all lurking within the aisles of Danish supermarkets you’ll appreciate the stakes can be quite high. One wrong move and you can find yourself sucking the wrong end of a mackeral. I loved grocery shopping in New Zealand. The supermarkets had wide aisles with variety and produce brought from the paddock just the day before. There were labels I could read, a cashier that talked to me and on a good day even someone to pack my groceries. I did not live in fear of being run over at the checkout when I failed to pay and pack fast enough or being unmercifully wedged in an aisle with pram, BBB (Bilingual Backpack Baby) and a shopping basket. If you’re likely to be grocery shopping in Denmark anytime soon it may be in your best interests to follow the below survival guide. Speed is everything. If you can’t pay, pack and move away from the checkout before the next customer needs to pack, then you’re likely to be on the receiving end of the ‘stink eye’. A fellow expat recently described this state as “Pay. Pack and get the hell out”. I couldn’t agree more. If you don't move fast enough at the checkout you'll likely be run over by one of these people. 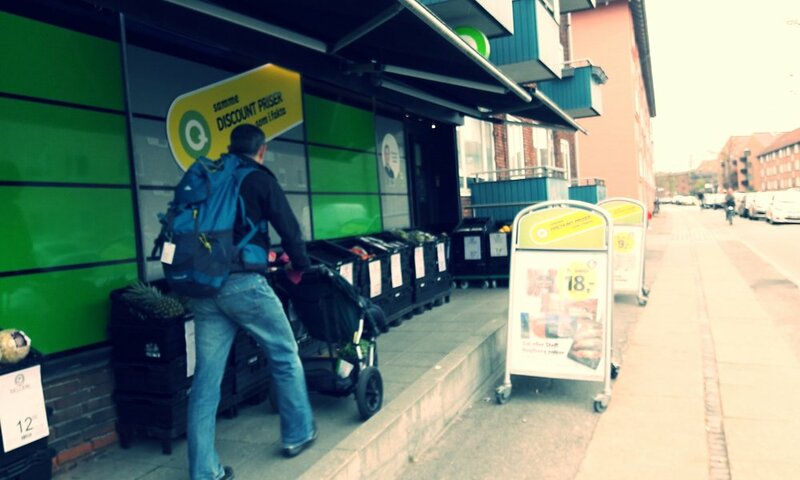 In Copenhagen, you’ll likely be visiting the supermarket on bike or foot so whatever you buy you’ll be carrying it home. Therefore choose wisely. As a rule of thumb, only buy what you can fit in your bicycle basket (imaginary or otherwise). The days of buying a week or fortnight’s worth of groceries and driving home are largely over. Now you must survive by buying groceries for just a few days in advance. Only enough to fill your bicycle basket. This will also help ensure you can achieve point #1. In terms of variety, expect none. The limited space, particularly in Copenhagen supermarkets, guarantees not only a high risk of being caught in a one-way traffic aisle jam but that you’ll also only ever find 1 or 2 brands of each product. The positive we can take from this is that you can now improve your PB (personal best time) while shopping by eliminating choices. Smaller stores means limited variety, but it can also means random finds every week too. You just can't guarantee they'll have it again next week. Be a ‘regular’ at your supermarket. Shop in the same supermarket every time and you’ll quickly master their layout enabling you to more successfully navigate your way around the shop. Thus also assisting with point #1. Make their place, your place. When you get to the checkout you will see what is quite possibly one of Denmark’s finest inventions - the conveyor belt divider. 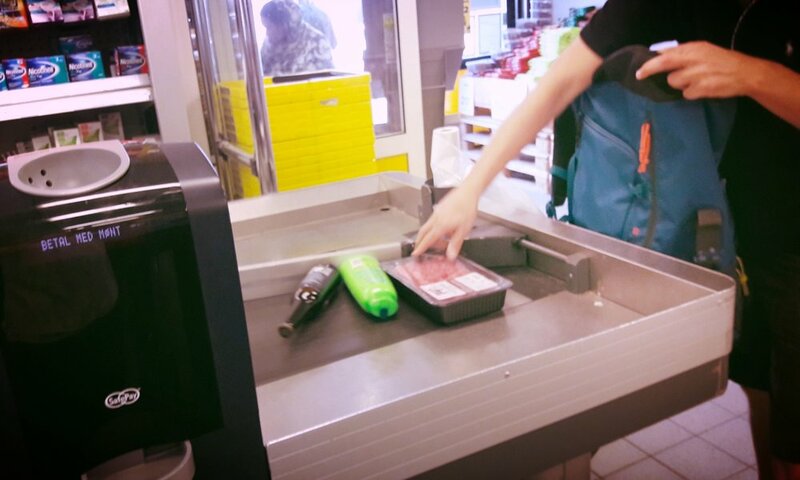 After scanning your groceries the cashier will swipe your groceries left or right for you to start packing them. This allows the cashier to start serving the next customer while you desperately try to pack your groceries from your side of the conveyor belt before customer #3 enters the picture. Note. Swiping left or right is not a sign of affection or otherwise. Your groceries will be either swiped left or right by a long metal divider so the cashier can start serving the next customer in line. Crucial for successful shopping is studying the small mountain of supermarket brochures that will arrive in your letterbox each week. Additionally they are also a very good way to find out what coloured napkins and candles you should be buying. Orange and black in October for Halloween. Yellow, green and purple in March for Easter. Do not dismiss this information. Candle faux pas are taken seriously in Denmark. DANISH LIFE HACK : you can sign 'off' from receiving all or some of these brochures at www.minetilbud.dk . PostNord also offers a similar service. After being lured to the appropriate store based on the promise of the specials in the brochures mentioned above, you then need to check that you are charged correctly. It is a regular occurrence at some supermarkets for ‘sale’ items to not be updated with the new price. We often have this surprise at our local Netto supermarket..
At the very least one aisle in the supermarket will be designated for candles and napkins. In New Zealand the ‘candle aisle' is where you go to fill your earthquake survival kit. In Denmark it is where you go to spend hours reflecting on what candle will work with what napkins according to the season. Whilst I may have exaggerated other aspects of survival in Danish supermarkets, I am not exaggerating this. Just wait for Christmas. They will be pallets of them. Everywhere. Avoid candle faux pas at all costs. If you want to buy basic groceries cheap and don’t mind shopping in a somewhat confusing labyrinth then Netto, Lidl, and Aldi are for you. Otherwise Fakta and Rema 1000 will allow you a bit more space and variety. If you fancy something a bit more leisurely with a bit more space then take a stroll around Kvickly, Føtex , Meny or Super Brugsen. If you're shopping to impress then head to Irma where you should be able to find everything you couldn't at the others. For the biggest head to Bilka. Or just want milk? Then go to your nearest supermarket because in Copenhagen you’re almost guaranteed to find at least 3 within a 2km radius. But be prepared for a lot of other products to look like milk and have google translate app at the ready to correctly identify the actual milk. Kids get a free bolle bun at Føtex! Want ‘normal’ ordinary (aka English Breakfast) teabags? Sorry. Wrong country. But you can email me for my secret bulk supplier. If you found this either helpful or amusing then please share. And let me know what other survival techniques you might have.